Combustion residuals from coal are commonly referred to as coal ash or fly ash. Potential environmental concerns with coal ash pertain to pollution leaching into ground water and other open water sources as a result of structural failures of impoundments or containment sites. Combustion residuals from coal are commonly referred to as coal ash or fly ash. Potential environmental concerns with coal ash pertain to pollution leaching into ground water and other open water sources as a result of structural failures of impoundments or containment sites. The EPA (Environmental Protection Agency) and various federal and state/provincial government agencies have regulated, or are in the process of regulating, the disposal of coal ash, requiring the use of geomembrane liners and cap systems. Layfield recommends using Enviro Liner® 4000 in 30, 40 mil or 60 mil thickness for coal ash containment. EL4000 is a flexible LLDPE, produced to meet or exceed GRI GM 17 standards. We can supply EL4000 in large prefabricated panels (30 and 40 mil), thereby reducing the amount of field seaming and your overall construction costs. EL4000 can also be supplied in a 60 mil thickness, which would require all seams to be field welded. For a permanent impoundment enclosure or cap application, we recommend Enviro Liner® 6000HD in a 30 or 40 mil thickness. EL6000HD is a high performance fortified polyolefin alloy geomembrane designed for long-term exposed applications. It has excellent chemical and UV resistance as well as physical properties. Tell us a little bit about your needs and we'll get right back to you with specific pricing. Get a full introduction to Layfield services with a Lunch & Learn session. 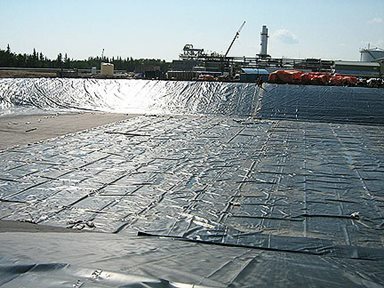 Layfield Environmental Containment is a vertically integrated company involved in the manufacturing, fabrication, installation, and maintenance of high performance geomembranes, floating covers, and specialty geosynthetics. We work with end users, consulting engineers and contractors to deliver products and services that protect the environment. Layfield Environmental Containment has strategic locations across North America and internationally. We are pleased to announce that Layfield USA has received the prestigious honor of being awarded the Exceptional Project Award & the Innovative Project Award by the Western Council of Construction Consumers, in tandem with the LA Department of Water and Power. © Copyright Layfield Group. Ltd. All rights reserved.